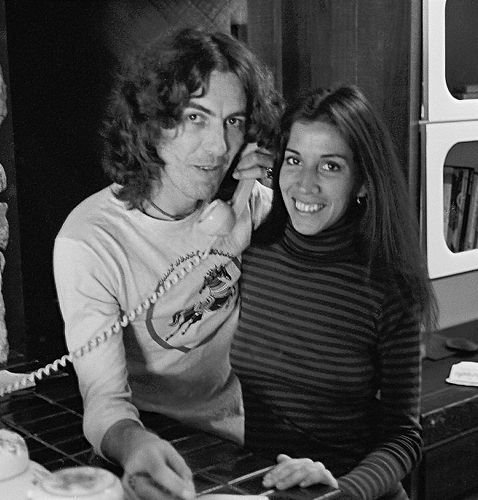 I think this is a very sweet photo of George and Olivia especially when you think that they first met over the phone. Olivia was a secretary and George would call and talk to her and from those phone conversations, George started to have feelings for Olivia, before he even met her. Did he even know that she was gorgeous? Olivia never claimed that she didn't know who George was. She even admitted that she saw the Beatles in concert in Los Angeles at Dodgers Stadium. I think they have a very sweet "how did you meet" story. Very unusual for rock stars, that is for sure! Olivia saw the Beatles twice, actually! One of the Hollywood Bowl concerts, probably 1965 one. The pic is from 1976 not 1974. Could this be Olivia's sister, Linda, who worked at Dark Horse?